Narthex Bench | Welcome Desk | Altar Furniture | Lewellen Design, Inc.
Lewellen Design, Inc. was founded in 1976 as an Industrial Design consulting office. In 2005, we added a Narthex Bench to our existing educational products and are now pleased to add additional designs to that product line. They are made in Ohio by Amish craftsmen to high standards for a long, serviceable life. They are for use in indoor seating areas such as a narthex, chancel, gathering area, student union, lobby, museum or other institutional usage. Your denomination, church, corporate or institution logo will be engraved on both ends. The preferred wood is shown on the Quotation Request form. Other optional woods are available upon request. Many Min-Wax wood finishes are available. The 3″ cushions have a foam filling with a choice of twelve fabric colors. Since this furniture is made to order, ask about any variations you might want. Fill in the Quote Request form or call for more information. This bench is our original design. Our standard design is made of oak and is made in Ohio by Amish craftsmen. As in all of our furniture, it is very sturdy and will provide many years of excellent service. With the exception of the seat base, it is of all solid wood construction. The cushion is 3″ thick foam with high quality upholstery material identical to that used in church seating. Your symbol on both ends. The Welcome Desk is designed for use in a lobby or Gathering Area to be used by a greeter to welcome arriving members and guests. It is higher than a standard desk with two drawers at the top to hold literature. Since this is custom-built, as is all of our furniture, the dimensions are negotiable. Your symbol will be engraved on both ends. With the drawers deleted, it is also makes a wonderful contemporary Altar or Communion table. Your symbol on both ends. This also may be modified to your needs. 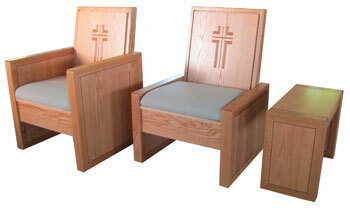 These Celebrant Chairs will enhance your Chancel and Pulpit with a quality, custom design. They will have your church symbol engraved into them. Made of oak by our Amish craftsmen, they may be altered to fit your exact requirements. Please call and let us discuss your specific needs. These reproductions may not exactly represent the actual colors. Additional colors available.